Lewis and his brother will harvest TEN termite hollowed sticks from Australia bringing them to us to create musical instruments. CLICK HERE FOR HARVESTING VIDEO. Reserve a spot early- first come first served. When spots are taken thats it. Yes two or more crafters can share a stick and fee. 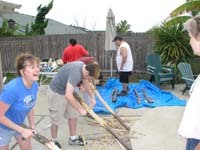 Make a Didgeridoo yourself or share your stick with family or friend! Please donate $225.00 (per stick) as a crafting fee. This includes the Didgeridoo Playing Workshop and Concert! No playing experience necessary. While the crafting class is limited to friends and family feel free to join us for the pot luck and evening performance! Great time to commission him for an artwork! Recommend that you you bring lawn chairs or blanket and flashlight. Kids are welcome. Swimming pool open to all but watch your kids. Swing set and sandbox for young ones. You may bring a tent and sleeping bags and camp overnight so you can relax! Like air conditioning? The Ayers Lodge in Alpine is only Six minutes away. Viejas has opened a new hotel that is 15 minutes away. Expected to be hot Saturday and Sunday and brisk in mornings. Swimsuit highly suggested to cool off and of course hats & sunscreen & lots to drink. Bring your specialty- our foods tend to be unusually good- not the usual chips and such! We have a fire pit for barbecuing, A propane gas grill, microwave, stove, and oven along with refrigerator to store in so you can prep your Pot Luck meal. $20 Suggested Donation per person for concerts. $20.00 suggested donation for playing workshop. Crafters Requested donation of $225 is all inclusive: includes playing workshop and concert. Carpooling is suggested- check out our facebook link and offer or ask! Take I8 east or west to the TAVERN ROAD EXIT to Alpine- head south on TAVERN ROAD. Stay Right if your eastbound The ranch is 6.1 miles down Tavern road- it changes names to Japatul rd. Gorangutang is a Los Angeles based group that mixes live elements of funk, hip hop, rock, and organic dubstep sounding didgeridoo rhythms. The group is led by William Thoren and Tra'zae Lewis-Clinton who often perform as a duo. The band draws from a larger network of musicians for recording and performing including Josh Jones, Andrew haas, Tracey Lewis (aka Trey Lewd), Brandon Loulias, Benzel Baltimore, CJ Henderson and Garret Shider. You have never heard anything like this: and orchestra of sounds but only one man with one instrument, a didgeridoo, playing solo without any tracks or distortion devices! ITS IMPOSSIBLE- but see for yourself- he does it! With beginnings in Uganda, and the seed sown there of a lifetime of interest in global cultures, it is no surprise that Stephen Kent has traveled the world, living at various times in Africa, England, Spain, Australia and, for the last 15 years, The San Francisco Bay Area. 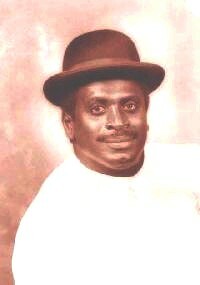 In Australia, in 1981, as Music Director of Circus Oz he first connected with Australian Aboriginal culture and the Didjeridu. You may bring a tent and sleeping bags and camp overnight so you can relax! GREAT weather- Should be SUNNY Saturday and SUNDAY! Temperatures will range from WARM to BRISK in mornings. The recent rains have removed the fire dangers so we will have a large campfire to sit around. Smores anyone? $40 Suggested Donation per person for concerts. No one will be turned away! Please arrive very early- tents make for a relaxed evening! Rain or shine we go on. In the event of rain we will move inside. Good weather is expected!! 6:00 Pamela Mortenensen in concert!!! 7:30 didge jam around fire pit through the night! Simeon Retz Drum leader: impromptu drumming workshops throughout the event. Didge Vendors & more onsite. Pam will join us coming from Washington to demonstrate own unique style of playing this most unusual of instruments weaving , voice, diaphragm, intricate Middle Eastern and Eastern European rhythms with urban beats. What comes out of it are stories of modern magic and ancient mysticism, poetry, worlds that are within and without all mixed with a little light, a little dark and often with a touch of humor. Pam will also have copies of her latest album available for purchase. The concert is free and supported by your direct donations to the artist.We need to make it worthwhile for these great artists to travel to us! 1. Techniques at all levels - breaking down techniques into doable accomplishments during practice. This will likely cover parallel playing as well or the art of layering sounds. 2. Building rhythms and composition - how rhythms can be built into phrases to form a cohesive song. 3. Practice techniques - what would be some good habits while the player sits down to practice. This would probably cover connecting with the instrument in a way to get a deeper and richer experience while playing. We will run it almost like a master class where people can let me know where they are in their playing, where they would like to be so I have a sense of what they would like to accomplish. So far it's been very well received and pretty successful. Jack will bring a large selection of didge’s for sale and that you can try out. Great opportunity for beginners to select the right instrument and get lots of help getting started. 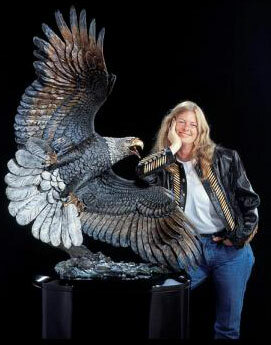 Kitty will be showing a few of her amazing sculptures where she seems to capture an animals spirit. Visit http://www.kittycantrell.com to view her quality works. Bring the family- we are kid friendly! SWIMMING POOL – Bring swim suites for kids and yourself. Watch your little ones if they are swimming- no lifeguard on duty. SWING SET and TEETER-TOTTER, Sand, toys, etc are there to play with. Overnight in sleeping bag/tent is fine. Great way to make for a relaxed night. Join us at Warners ranch at 10 am on. We will sit around a very large warm fire that Is suitable for cooking. BRING A FLASHLIGHT, CHAIR, BLANKET. We are quite proud of our potlucks- we enjoy dining with fine wines and unusual beers. Quality counts! You will find very few folks bringing chips and dips: Foods that are often brought are Lobster, Tri-tip, Lasagna, Gourmet soups, Seafood Paella, etc. Vegetarian dishes are always popular! The campfire is suitable for cooking and we have a large propane grill along with kitchen: stove , microwave, refrigerator so you can warm up your dish or do some final touches. Please pass this information on to those who would appreciate it. We will have our usual Pot luck & jam after the show. mini mart gas station on the corner.woodwards country store is across the street.go on hwy 78 awhile [like your headed to escondido]..past weekend villa road.past indian oaks road.very next turn you can make when you pass indian oaks is horizon view.turn left onto it. JANUARY 2 2010 in ALPINE. You have never heard anything like this- the links below are one man with one instrument, a didgeridoo, playing solo without any tracks or distortion devices! ITS IMPOSSIBLE- but see for yourself- he does it! WILLIAM THOREN: 4-5 CONCERT & “The Low Note” WORKSHOP FROM ONSTAGE! This is a chance to explore an unusual technique that makes your didge seem like a lower player. Meet William: http://www.williamthoren.com/www.williamthoren.com/About_Will.html Check out the amazing didges he creates to take advantage of his technique. Bring the family- we are kid friendly! This month we have a FULL LENGTH CONCERT - Come and listen- they DONATE IF YOU LIKE THEM! Join us at Warners ranch between 2:00 and 12:00. It gets cold here...so wear your long undies and we will sit around a very large warm fire that Is suitable for cooking. Layer your clothes while it will be cold the fire gets HOT within the stone circle! BRING A FLASHLIGHT, CHAIR, BLANKET. If the weather turns on us we will gather inside- so rain or shine: don't let the weather stop you! We are quite proud of our potlucks- we enjoy dining with wines and beers quality counts! Foods that are often brought are Lobster, Tri-tip, Lasagna, Gourmet soups, etc. Vegan is always enjoyed! The campfire is suitable for cooking and we have a large propane grill along with kitchen: stove , microwave, refrigerator so you can warm up your dish or do some final touches. Jeremy Donovan ( Yongurra Yerin ) is a Descendant of both the Gumbainngirr Nation Nth NSW and the Kuku-Yalanji Nation of Far Nth Qld, Australia. WORKSHOP/CEREMONY $50.00 donation suggested. The jam/potluck is free but we ask that you donate as you can. Overnight in sleeping bag- please inform us as we have limited room. Join us at Melindas home in Alpine, Ca. The healing ceremony is open to all- please pass this information on to those who would appreciate it.We will have our usual Pot luck & jam @5. We are quite proud of our potlucks- we enjoy dining with wines and beers quality counts! Foods that are often brought are Lobster, Tri-tip, Lasagna, Gourmet soups, etc. the right at the "Y". Take the right turn before passing the white mailboxes, come straight back into the driveway flanked by the low rock wall. 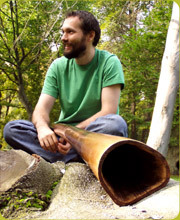 Using the Ancient Didgeridoo, Traditional Chants and Body work, Jeremy can take people deep into the realms of the Dreamtime. Jeremy runs both 2hr and 4 hr workshops and also offers 1 1/2 hr sessions for individuals. Jeremy talks and offers an insight into the traditional healing practices of the Far Northern Queensland Aboriginal people. 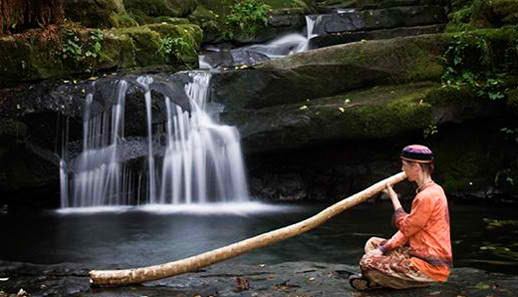 The vibration of the didgeridoo on the body accompanied by the chants is something that has been practiced in the rainforest for in excess of 5000yrs. In addition to the Healing Jeremy talks about the connection to Ancestral Spirits and the Animals and how they play such a strong role in the shaping of our lives. Jeremy's traditional healings are designed to support the movement of negative stored energy that we as humans hold onto. 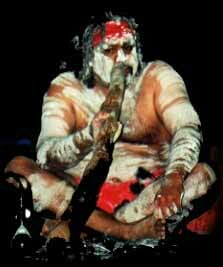 The Didgeridoo's vibration enters the body shaking our cells and breaking through the tissues where we store such energy, then with traditional chants these energies are moved from our bodies into the Spirit World where they can be healed. Descends from both the Kuku Yalanji tribe of Far Northern Queensland and the Gumbaynngirr tribe of Northern New South Wales, but represents Australian Aboriginal Culture as a whole. Jeremy is recognised around the world as one of Australia's Finest Aboriginal performers. Jeremy shares his life and personal stories through music, art, dance and healing with thousands of people each year from all corners of the world. 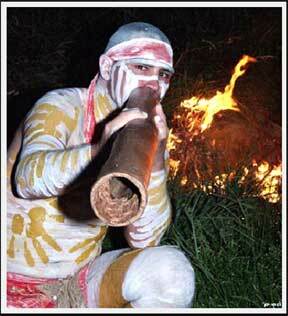 Jeremy's passion for his culture is infectious, he mesmerises his audience with his masterful Didgeridoo playing. "I teach people through my music, dance, stories and art. There is nothing in this world that gives me greater pleasure as sharing my peoples history with people who come from lands far and wide." Jeremy is quickly becoming recognised as one of the Australia's fastest growing young Aboriginal Artists, with four sell out solo exhibitions in Australia and the USA and artwork being displayed throughout the world, becoming a very collectable artist. "I love my culture, i am very proud of where I come from. When I perform I want people to feel my pride. When i share my stories I want people to be touched. I want my songs and the Didgeridoo to resonate through there entire body. When I play didgeridoo, when I sing, when I dance, when I paint, I want people to be able come on a journey with me. I want people to know my life and my incredible culture." Artwork - Jeremy Donovan is one of Australia's most recognisable Didgeridoo performers,but internationally Jeremy is recognised as one of the most collectable young indigenous artists. Jeremy uses traditionally inspired stories and portrays them with a modern edge. Jeremy's paintings are all individual. If you are interested in commissioning Jeremy to paint an individual piece for your collection, home or office please contact Jeremy to speak about the Specifics. Didge, Drum, Flute, etc. gathering JULY 11 in RAMONA at Kitty’s home between 4:59-9:00. Pot luck as always featuring quality foods- we LOVE to eat well! A small fire that also serves as warmer and BBQ to help drive away any cold air- if it occurs. Dress warmly and bring lots of positive energy. Guests are welcome. Bring your didge, drum, flutes, Fujairah.... and join us at Melinda’s home in Alpine, Pot luck as usual. Plan for 8 to 15 at these smaller gatherings. Beginners are welcome and there are almost always didge’s to try and many for sale. Meet us at 1468 Midway Place in Alpine. Directions: I-8 east to Tavern, south on Tavern to 4-way stop at Arnold, turn West (right), take first Right onto Midway Drive, go .7 mile to a left at Midway Place (heading south again). Now the fun part - Cross the bridge and go up the hill, keep to the right at the "Y". Take the right turn before passing the white mailboxes, come straight back into the driveway flanked by the low rock wall. For the shortest driving distance possible volunteer to host a gathering- it’s easy! Contact Warner at 619-683-2637. If you hear of any didge players touring the US that might be passing by our region lets contact them for a gathering/ workshop/concert. San Diego seems to get bypassed and lumped in with Los Angeles despite our having one of the largest active didge playing community in the country! Mark your calendars: August 14, 15, 16 - the LAST JT! Near Fishcamp close to Yosemite. http://www.jtdidgefest.com - don’t miss it! MARCH JAM WAS AWSOME- check PAST JAMS for pictures and movies! This workshops fun! Beginners especially will benifit with Lewis’s methods of teaching you to circular breathe. Animal sounds are his specialty- learn to play a dingo with another dingo responding in the distance. Learn about aboriginal life and more. After Lewis your lessons join us around the campfire as we all play together. Cost if the workshop is estimated at $20.00- but free to Didge Workshop Attendees. IT WAS GREAT-see PAST JAMS for pictures and movies! Danny will join us at our jam and will be offering a class in Jaw Harp and Body Percussion. If you havent seen this master check out the links- he is amazing! The workshop is $20.00 (bring your harp!) . Danny will bring some harps and make them available as a workshop/harp package for $35.00. GREAT TEACHER! -see PAST JAMS for pictures and movies! Learn how to twirl Poi fire pots. Jake will have practice Poi’s available for learning. Impromptu classes may form during didge play. Donations to Jake are appreciated. Please find and invite DANCERS, Poi twirlers, Didge, flute, etc.. players that would complement the music and we can always use a drummer- particularly native American style.